Online Croatia Perfect apartment or villa in Croatia - how to find it? Do you want to spend your holiday in a quiet, relaxing surrounding or you want to explore as many places as possible, visit historical sites, learn the culture and way of living in Croatia and book perfect apartment or villa for your vacation in Croatia? Croatia offers you different types of holidays. If you are planning to go for your holiday during the summer, you should definitely spend the most of your holiday time in Dalmatia. Dalmatia is a costal part of the Adriatic Sea and it is rich in historical towns, National parks, beautiful islands with untouched nature and secluded beaches. 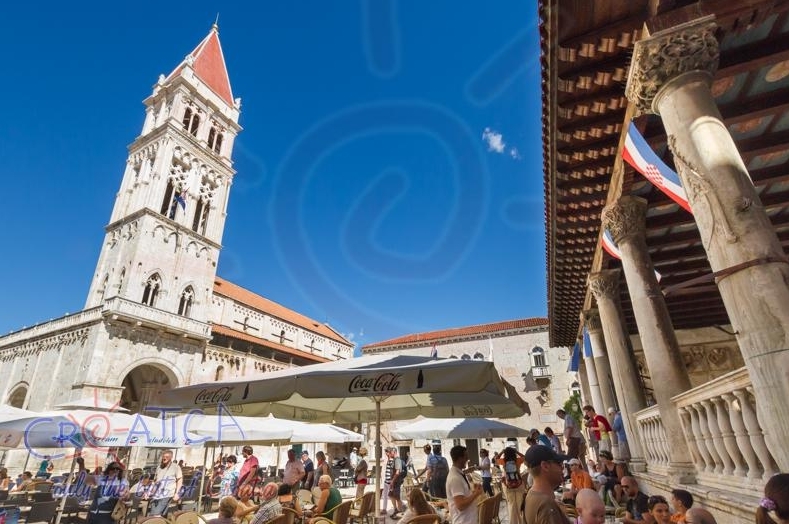 Trogir, Split and Dubrovnik area are the most attractive tourist destinations. This area of Middle Dalmatia has great geographical location. It is located near Split airport which offers lots of cheap flights to Croatia from various world known destinations. You can also reach Middle Dalmatia by highway Zagreb-Split or by ferry from Italy. Split port has very frequent ferry and speedboat connection with Dalmatian Islands Hvar, Brač, Šolta, Korčula. If you are on a short 3, 4 day holiday, you should choose apartments or rooms in the town of Split where you can explore the city itself, its historical monuments and sights, beautiful beaches and exciting night life. Split is the second largest town of Croatia and the centre of Middle Dalmatia. You can choose apartment in the city centre- Old Town, near popular beaches (Bačvice beach, Meje beach) or in its neighbourhoods (Veli Varoš for example). Since Split offers a lot of vocational homes and apartments you will be able to find luxurious to low budget ones. After making the sightseeing and enjoying the crystal sea, take your time to visit Solin, Omiš, Trogir and islands Hvar,Brač or Šolta. These destinations are very close to Split so you can choose one as your daily trip! Town of Trogir is also a beautiful place for holiday relaxation! Trogir is located only 24km from Split and 8km from Split airport and it offers you numerous options for finding the perfect holiday apartment or villa in Croatia. Trogir is famous for its historical sights and the city centre is under UNESCO’s protection and listed as world heritage. Trogir offers you beautiful beaches, restaurants with traditional Mediterranean dishes and friendly and warm hosts. Trogir and its surrounding places are destination for long stay holiday, therefore some renters take reservations for minimum 7 night stay and they prefer reservations with arrivals and departures on Saturdays. Pay attention on the conditions of booking under the apartment listing! Apartments are rented mostly from May to October, the high season is considered as July and August. Booking starts from January, even though the peak reservation time is around April and May. Consider this when deciding when to book and if you find the apartment that you like it is better to book immediately so you do not lose it. Perfect apartment or villa in Croatia – how to find it ? Do not expect first minute offer deals for high season period; renters will not lower the price because they know they will definitely sell this period. Since the high season is only 2 months, you will notice the big difference between June and July, most of the renters put much lower prices for the offseason. If you are booking late, in July and August, ask for the last minute deals! Apartments or villas in Trogir can be found near the city centre or in nearby villages on the Island Ciovo. Island Ciovo and Trogir are connected with small bridge which is opened 24/7. All parts of Ciovo Island are 2-12km far from Trogir. If you decide to book apartment in Trogir, you can go for daily beach day on Ciovo Island and discover small, charming villages by the sea. Apartments or villas on Ciovo Island vary from low cost apartments to astonishing modern beachfront villas with pools. If you are traveling for relaxation, Ciovo Island is perfect holiday destination. If you are traveling with your family and children, check first the beaches and the distance from the apartment. Even though, these villages are small and you will be able to walk to beach, you have to check if there is some hilly route, stairs and most important whether the beach is suitable for children. Most of the beaches on Ciovo are pebble and stone beaches suitable for children; unfortunately, there are no sandy beaches here. If you are looking for animation for your children, choose apartment near playgrounds and sports centres. Okrug Gornji (the biggest village on Ciovo) can definitely be the perfect holiday location for your family since it offers lots of summer activities especially for the young ones. This area also offers you lots of restaurants, shops, 3km long Copacabana beach and lots of small hidden bays. There is a boat on a daily basis for Trogir. While staying here you should definitely visit nearby islands Drvenik Mali and Drvenik Veli and discover the unspoiled nature and beautiful sandy beaches. Other places on Ciovo Island where you can find nice apartments are: Mastrinka, Arbanija, Okrug Donji and Slatine. So, whether you are looking for relaxing or active holiday, Trogir and Split area will fulfil your wishes! Find perfect apartment or villa for your vacation in Croatia and enjoy your new holiday home!